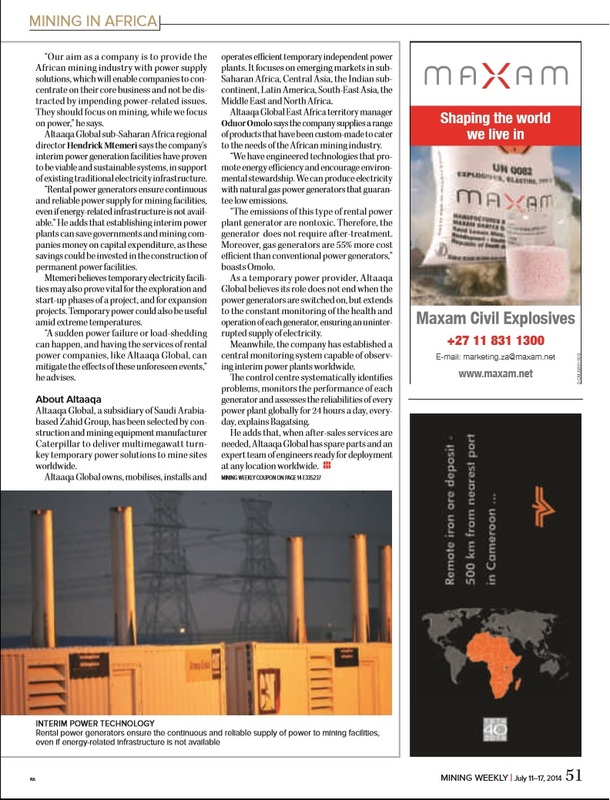 The deficiency in power generation on the African continent is impacting on the mining industry’s ability to reach its full production potential, thereby impacting on the industry’s ability to boost the continent’s economy, says Dubai- based temporary power solutions provider Altaaqa Global CAT Rental Power marketing manager Robert Bagatsing. 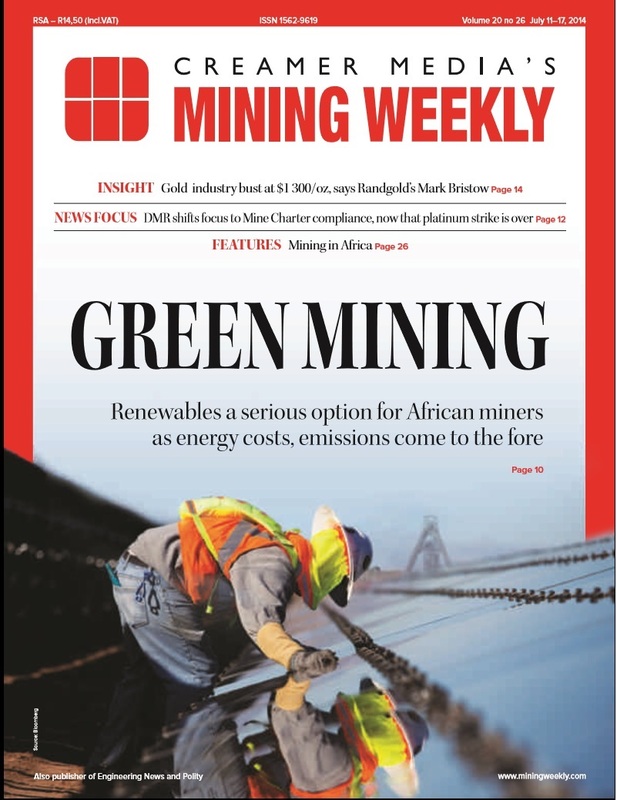 He tells Mining Weekly that power is necessary for all mining operations and that its absence could lead to significant financial, operational and social losses. 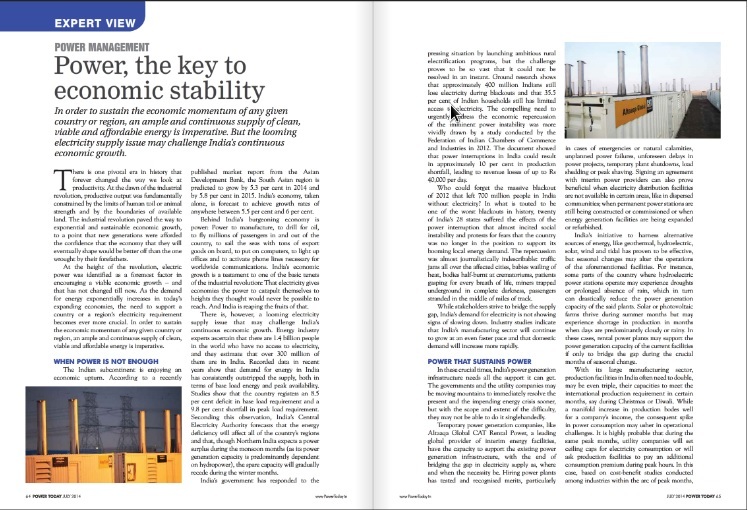 “It is crucial to maintain a continuous and reliable power supply at mining locations. A few minutes without electricity can halt operations and endanger the lives of mineworkers – for instance, in cases of extreme weather,” says Bagatsing, adding that a brief power outage can also impact significantly on the profits of an operation. Altaaqa Global CAT Rental Power opened a Southern African branch, in Johannesburg, this year, which caters to several African countries, including South Africa, Angola, Botswana, Mozambique, Madagascar, Malawi, Namibia, Zambia and Zimbabwe. Altaaqa Global Southern Africa territory manager Paul Heyns says the new office is part of the company’s drive to be closer to its clients and react more swiftly to their requirements. The expansion is part of the company’s over- arching vision of being Africa’s preferred temporary power solutions provider by 2022. Altaaqa Global believes that upgrading existing power generation facilities and constructing new electricity plants to boost the supply of power to remote mining locations are two probable and lasting solutions to the power problems facing Africa’s mining industry. However, Bagatsing says this is easier said than done, as it can take up to five or even ten years for a power plant to become operational. Bagatsing warns that mining companies cannot afford to continue facing the economic and operational consequences of unstable or absent power without assistance from other industry stakeholders. With the mining industry’s reliance on energy and the impact of power supply disruptions on production and costs, an urgent solution is necessary to keep the mining industry afloat, says Bagatsing, adding that the industry needs a resolution now, not in five or ten years’ time. 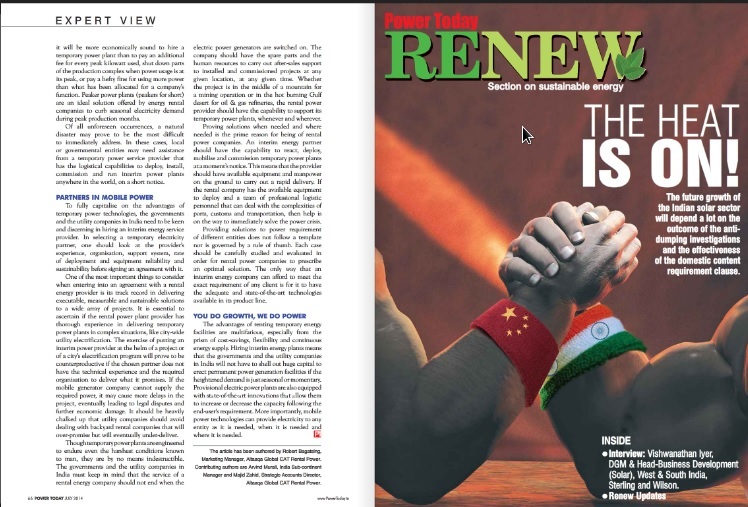 “It may just be a matter of introducing the concept of interim power technology to the region. We believe that Africa will soon have a better understanding of the benefits of rental-energy technology and will, therefore, be able to grasp its potential. 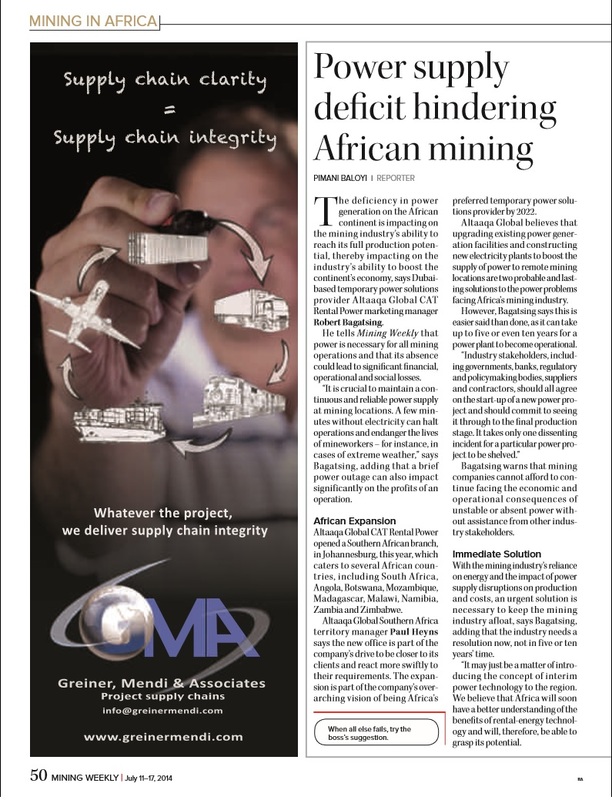 “Our aim as a company is to provide the African mining industry with power supply solutions, which will enable companies to concentrate on their core business and not be distracted by impending power-related issues. They should focus on mining, while we focus on power,” he says. Altaaqa Global sub-Saharan Africa regional director Hendrick Mtemeri says the company’s interim power generation facilities have proven to be viable and sustainable systems, in support of existing traditional electricity infrastructure. He adds that establishing interim power plants can save governments and mining companies money on capital expenditure, as these savings could be invested in the construction of permanent power facilities. Mtemeri believes temporary electricity facilities may also prove vital for the exploration and start-up phases of a project, and for expansion projects. Temporary power could also be useful amid extreme temperatures. “A sudden power failure or load-shedding can happen, and having the services of rental power companies, like Altaaqa Global, can mitigate the effects of these unforeseen events,” he advises. Altaaqa Global, a subsidiary of Saudi Arabia-based Zahid Group, has been selected by construction and mining equipment manufacturer Caterpillar to deliver multimegawatt turnkey temporary power solutions to mine sites worldwide. Altaaqa Global owns, mobilises, installs and operates efficient temporary independent power plants. It focuses on emerging markets in sub- Saharan Africa, Central Asia, the Indian subcontinent, Latin America, South-East Asia, the Middle East and North Africa. Altaaqa Global East Africa territory manager Oduor Omolo says the company supplies a range of products that have been custom-made to cater to the needs of the African mining industry. “We have engineered technologies that promote energy efficiency and encourage environmental stewardship. We can produce electricity with natural gas power generators that guarantee low emissions. “The emissions of this type of rental power plant generator are nontoxic. Therefore, the generator does not require after-treatment. 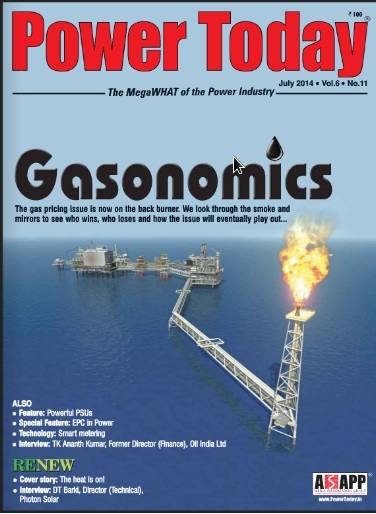 Moreover, gas generators are 55% more cost efficient than conventional power generators,” boasts Omolo. As a temporary power provider, Altaaqa Global believes its role does not end when the power generators are switched on, but extends to the constant monitoring of the health and operation of each generator, ensuring an uninter- rupted supply of electricity. Meanwhile, the company has established a central monitoring system capable of observing interim power plants worldwide. The control centre systematically identifies problems, monitors the performance of each generator and assesses the reliabilities of every power plant globally for 24 hours a day, everyday, explains Bagatsing. He adds that, when after-sales services are needed, Altaaqa Global has spare parts and an expert team of engineers ready for deployment at any location worldwide.